Your asthma medications will vary in a number of ways, such as the route of delivery, frequency, and dose. Asthma inhalers are inhaled directly into the lung, while some asthma drugs are taken orally in pill form. It is important that you not only know the correct dose and frequency of all your asthma medicines but also the potential side effects and how to prevent them. There are a number of different asthma medications available by prescription. A few of those are very common and included here. Take some time to learn more about the medications you've been prescribed. It's always a good idea to learn as much as you can because this knowledge helps you speak with your doctor. There may also be times when you forget a few details they said in your appointment, so a quick review every now and then can serve as a good reminder. Advair is one of the controller asthma medicines that combine two drugs into one inhaler. It includes both an inhaled steroid and a long-acting beta agonist (LABA). This option is used when an inhaled steroid alone does not adequately control your asthma. A few studies have suggested the possibility of using a combination product as your only inhaler for both control and acute symptoms. Albuterol is a quick-relief or rescue medicine that relieves acute asthma symptoms. It falls into the drug class of a bronchodilator. If you use this asthma medicine too often (for instance, more than twice per week), it is a sign of poorly controlled asthma. 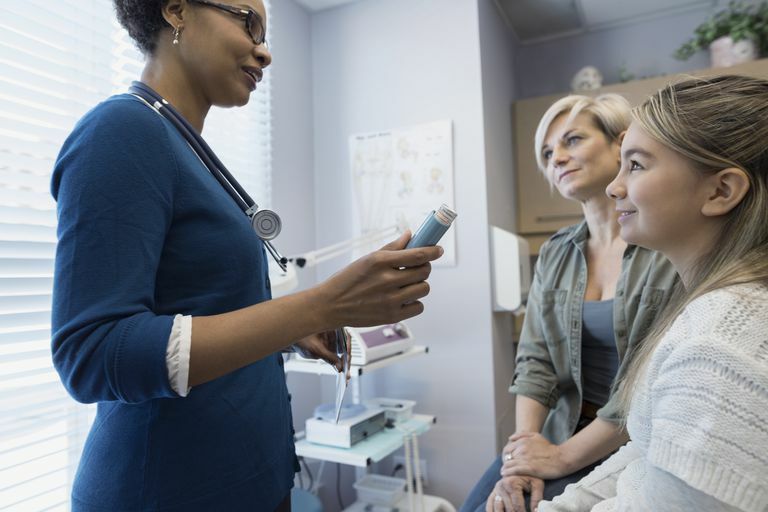 As a result, your doctor may need to adjust your asthma plan. Asmanex Twisthaler contains the inhaled steroid mometasone furoate. Asmanex, like a number of other asthma drugs, blocks the action of cells in the pathophysiology of asthma. Flovent is an asthma drug containing the steroid fluticasone propionate, one of the components of Advair. This is a controller medicine that will reduce inflammation in your airways but needs to be taken daily to improve your asthma. Prednisone is an oral steroid. These are also called systemic corticosteroids and are often used when you develop an asthma exacerbation or attack. This form of steroid is different from taking inhaled steroids for asthma because it affects the entire body. Pulmicort (budesonide) is a controller asthma medicine. It is a first-line treatment when you need more than occasional use of your rescue inhaler. Pulmicort can be prescribed by itself or combined with another asthma medication like a long-acting beta agonist to prevent asthma symptoms. Qvar contains the steroid beclomethasone dipropionate. Like other inhaled steroids, Qvar is considered a first-line treatment to control asthma symptoms when you need to use your rescue inhaler more than twice per week. Qvar is prescribed by itself, but your doctor may also have you take a long-acting beta agonist. Singulair (montelukast) is used as an alternative therapy for the treatment of mild persistent asthma. Singulair can also be used for the prevention of exercise-induced asthma and in the treatment of allergic rhinitis and atopic dermatitis. Slo-Bid (theophylline) is in a class of drugs called methylxanthines. With the advent of newer asthma medicines, theophylline is not used as often today. This asthma drug improves symptoms through its action as a muscle relaxant. It opens up constricted airways and may have mild anti-inflammatory properties. Symbicort is a combination asthma medicine that contains budesonide and formoterol. Xolair has been shown to decrease the frequency of asthma attacks in moderate persistent and severe persistent asthmatics. It may also decrease or eliminate the need for other asthma medications. Xopenex is a rescue inhaler like Albuterol and is used to relieve acute asthma symptoms. It can improve bronchoconstriction and shortness of breath. No matter which medications you are taking for your asthma, try to have a thorough discussion with your doctor. They are an integral part of your asthma treatment and need to know of any concerns or questions you may have. If you think of questions in between appointments, write them down or give their office a call as a nurse may be able to help you as well. Cates CJ, Karner C. In People With Asthma Are Single Inhalers That Contain Both Formoterol and Budesonide Better Than Current Best Practice? The Cochrane Library. 2013. .
National Heart, Lung, and Blood Institute. Expert Panel Report 3 (EPR3): Guidelines for the Diagnosis and Management of Asthma. 2012. Is Flovent Helping Your Asthma? Do I Need a Beta Agonist for My Asthma? Is Theophylline a Good Choice for Treating Your Asthma? Are Combo Inhalers Better for Your Asthma? Does Symbicort Help Control Your Asthma?